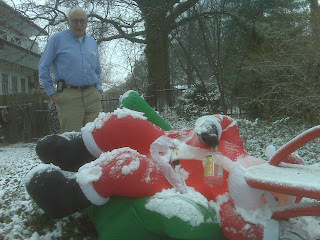 He said this would be his last chance to imbibe before getting the sleigh all cleaned up and loading up all the toys. We said, ok but don't do this again; you're making our yard look like a frat house. Just milk and cookies from now until after Christmas. And Tom looks on like Santa's disapproving AA sponsor. I'm sorry I gave Santa the whiskey.